The World Health Organization (WHO) lists six 'classic' air pollutants: carbon monoxide (CO), lead (Pb), nitrogen dioxide (NO2), sulphur dioxide (SO2), tropospheric ozone (O3) and suspended particulate matter (SPM) - including dust, fumes, mists and smoke -). PM is distinguished as different inhalable fractions that are classified as coarse and fine particulates with aerodynamic diameters below 10 µm (PM10) and 2.5 µm (PM2.5) respectively. The burning of fossil fuels and biomass is the most significant source of air pollutants such as SO2, CO, certain nitrous oxides such as NO and NO2 (known collectively as NOx), SPM, volatile organic compounds (VOCs) and some heavy metals. It is also the major anthropogenic source of carbon dioxide (CO2), one of the important greenhouse gases. Beside effects on human health, air pollution has adverse impacts on crop yields, forest growth, ecosystem structure and function, materials and visibility. Air pollution has decreased in some cities in different parts of the world through a combination of technology improvement and policy measures (Polluter Pays Principle). However, increasing human activity is offsetting some of the gains. The most polluted cities are now found in Asia. This is a consequence of the massive industrial expansion. In most of Asian cities, both SO2, NO2 and PM10 levels are above the WHO guidelines. Throughout Asia, lead emissions from vehicles are also well above safe levels. Of the 15 cities in the world with the highest levels of PM, 12 are located in Asia. Of these cities, 6 also have the highest levels of atmospheric SO2. The most important air pollutant from a disease perspective is fine particulate matter. WHO estimated that particulates in urban areas worldwide cause about 2% of mortality from cardiopulmonary disease in adults, 5% of mortality from cancers of the trachea, bronchus and lung, and about 1% of mortality from acute respiratory infections in children, amounting to about 1% of premature deaths in the world each year. About 2.4 million people die prematurely every year due to fine particles: one third due to outdoor urban PM10 and two-thirds due to indoor PM10. The highest number of estimated annual premature deaths occurs in developing countries of Asia and the Pacific. Over the last two decades, emissions of S02 and NOx have increased, sometimes dramatically, in the industrializing nations of Asia. 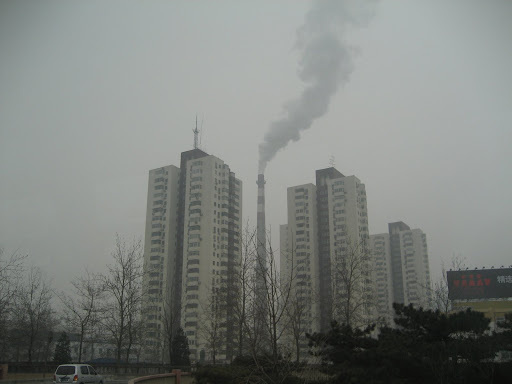 For instance, from 2000 to 2005 the Chinese SO2 emissions increased by approximately 28%, and satellite data suggest that NOx emissions in China have grown by 50% between 1996 and 2003. Sulfur dioxide emissions, which lead to acid precipitation which in turn damages crops, forests and eats away at synthetic structures and other materials, are increasing in respond to the growing use of coal and other high sulphur fuels in Asia. At least two-thirds of acid depositions in the region are caused by coal-fired power plants with outdated pollution control equipment. Transport has become a major source of urban air pollution. The motorized fleet has been growing rapidly; for example, the number of cars in Delhi and Manila has been doubling every seven years for the past 30 years. This fact, combined with poor roads, fuel quality and vehicle maintenance, makes vehicular air pollution an alarming issue. The other sources include industrial emissions, burning of solid and liquid fuels for power generation, and burning of biomass and other fuels such as charcoal for household use. Young Vietnamese lady wearing mask to keep out pollution in Hanoi, Vietnam. Estimated annual average concentrations of PM10 in cities with populations greater than 100 000, and in national capitals, for 1999. The current WHO annual mean guideline for PM10 is 20 µg/m3. Traffic. Amount of space required to transport the same number of passengers by car, bus or bicycle. Haze are clouds - known as Atmospheric Brown Clouds - of tiny aerosol particles from emissions hang over a number of Asian regions. These seasonal layers of haze reduce the amount of sunlight that can reach the Earth’s surface, which has potential direct and indirect impacts on the water cycle, agriculture and human health. Simulations with global climate models indicate that the haze could have major impacts on the monsoon circulation, regional rainfall patterns and vertical temperature profile of the atmosphere. Haze problems are also prevalent in the region due to forest fires in Southeast Asia. The most serious episode occurred in 1997, when the effects of forest fires in Indonesia extended to neighbouring countries. Smoke and smog over Indonesia, TOMS Earth-probe (22/10/97). Indoor air pollution is often a more severe health hazard than outdoor air pollution. Most rural inhabitants in the region use twigs, grass, dried animal dung, crop residues, wood, charcoal and kerosene as household fuels. Coupled with inadequate ventilation, this results in highly contaminated indoor air. Given the high levels of harmful emissions and the number of people using traditional cooking fuels - Asia produces nearly half of the world's woodfuel - the scale of exposure is large. A total of 1.6 million people (mainly women and children) are estimated to die prematurely each year due to indoor air pollution exposure. Health effects include acute respiratory infection in children, chronic obstructive lung disease, adverse pregnancy outcomes and lung cancer. The key areas for intervention are: use of cleaner fuels such as low-propane gas and kerosene; development of high-grade biomass fuels; improvements in stove design and better dissemination of stoves; improvements in housing; and improvements in environmental awareness and education. Global estimates of disease attributed to indoor air pollution, measured in proportion of DALYs.